Windows 8 and OS X Lion: How Do They Compare? It’s still far too early in Windows 8’s development cycle to pit the nascent OS against its fully baked competition. But Apple’s recently released OS X Lion offers the most recent competing view of what a PC operating system should look like in the age of the smartphone and tablet. I like to think I’m platform agnostic: I game on a Windows desktop, I work on an Ubuntu desktop, and I recently picked up a MacBook Air to replace an aging Windows laptop--and to complete the set, to be honest. Lion has been my first real taste of Apple’s take on the desktop OS (I’ve owned iPads and iPod Touches), and I’m liking what I’m seeing: It’s a decidedly modern OS, blending lessons that Apple has learned from iOS into a form that makes sense when you have a proper keyboard and pointing device available. That said, my admittedly limited time with Windows 8 has been something of an eye-opener. There’s still quite a bit of time before it’ll see the light of day, but Microsoft’s vision of the future of operating systems reflects the company's time in the mobile arena, and the culture war it has arguably lost in light of Apple’s meteoric rise in popularity. So how do the two OSs compare? Mac fans are legion, so I’m sure that plenty of people out there are willing to explain why a brushed-steel wrapper on absolutely everything is the pinnacle of design. The uniformity bleeds down from the frame right onto the user interface, without much in the way of customization options--barring third-party utilities, of course. I’m not much of a stickler for this sort of thing (function over form, always), but I find Windows 8’s colorful aesthetic so much more ... well, pleasant. Bright and inviting aren’t words I like to ascribe to operating systems, or any other tool. But they’re apt here. Given the choice between Apple’s staid minimalism and the lively interface Microsoft has whipped up, I’m going to gravitate toward something that’s a little more lively. But looks aren’t everything, and the Metro interface will be the biggest hurdle for onlookers to get over--whatever your platform of choice. It’s important to understand that Microsoft hasn’t simply shoehorned a desktop OS into a tablet product. The company has created an operating system to address the sea change in technology we’ve witnessed over the past few years, and it's kind enough to bring archaic, touch-free platforms along for the ride. As the PCWorld editor charged with covering desktop PCs, I view a touch-centric OS from the leading developer of PC operating systems as the sort of thing that will get me looking over my résumé. But Windows 8 isn’t about ditching the mouse and keyboard so much as it is about addressing the way we use technology today. Lion's Launchpad makes it easier to, well, launch your apps. Lion is taking steps in the right direction: You can see hints of Apple’s future (I hope) in the Launchpad, which borrows heavily from iOS. Applications are condensed into icons, with numbers giving you a bird’s-eye view of anything that needs your attention. Windows 8 goes one step further: Tiles are much more useful, doling out information at a glance, instead of forcing you to dive into a particular app to see what messages or notifications await. File trees and folders are archaic. They hark back to a time when finding a specific photo or a particular track off an album required remembering where you put it. Today, search is king. And I thought it couldn’t get easier than Command-Space on the Mac, which brings the focus over to the Spotlight search bar. Windows 8 offers the same functionality, but divvies results up into Apps, Settings, and Files, and rolls some extra functionality into the mix: A search for “cake,” for instance, will point to any files on the device, and with a tap (or click) I can extend that query to Facebook, Twitter, or locales nearby--it turns out there are quite a few bakeries in the area. 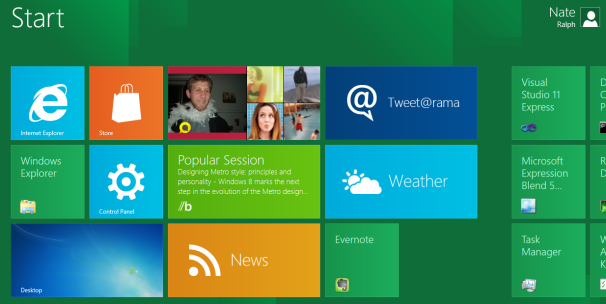 Windows 8‘s tiles, while attractive, are ultimately unwieldy. Sliding through the list of colorful icons is pretty cool the first few times. But should your collection of Metro apps start to grow, you’ll be stuck with page after page of animated tiles to flip through and organize. A few pinching gestures make sifting through tiles a bit more efficient, and you can group preferred applications together and simply shunt the rest to the far right of your Start Screen. But a time will come when you’ll have too many tiles and Metro apps to manage efficiently. As Windows 8 is still in its early stages, I can only imagine that a superior method of navigation is on the way--iOS didn’t get folders to corral apps until version 4, after all. Not much of a contest here: When it comes to multitouch-friendly shortcuts, Lion’s trackpad gestures come out ahead. Apple's trackpad gestures may seem arcane at first, but they work. Windows 8’s gestures rely on the touchscreen: pulling up the Start button with a swipe from the right, or reaching the application bar by swiping up, for example. That’s all fine, but those of us without touchscreens are back to right-clicking the mouse or pressing keyboard shortcuts. There’s nothing particularly wrong about that, but I must admit that my time with Lion has made me a believer in gestures. Carving what amounts to arcane runes onto my trackpad is an efficient way to jump across multiple desktops and applications, or to flip back and forth between Web pages in Google Chrome. In addition to being awesome, of course. My MacBook Air isn’t going anywhere--the Windows 8 PC experience is still dependent on Samsung, Toshiba, Dell, and the rest, and my confidence in their ability to deliver a laptop that’s portable, powerful, and (relatively) inexpensive runs thin. But once my time with this developer preview slate draws to a close, I’ll certainly be downloading the build that Microsoft is making available, and spending a few months watching this OS develop. I have a bit of a bias here--I just like new things. But I haven’t been so excited for something as mundane as an operating system in a long time. We have more Windows 8 news than you can handle. See our full coverage.